You know Bang Bang Shrimp, that fried shrimp mixed in spicy-ish sauce that you find at a variety of Asian and non-Asian themed chain restaurants all over the United States? It’s insanely easy to make. Also, it isn’t healthy. I have this….giggle….that happens when someone acts like ordering fried shrimp covered in, let’s be honest, MAYONNAISE is in any way a healthy choice. Delicious? Sure! Healthy? Sorry, buddy. Not quite. That being said, to me, the deliciousness is enough to make up for the fried/mayo component every once in awhile! 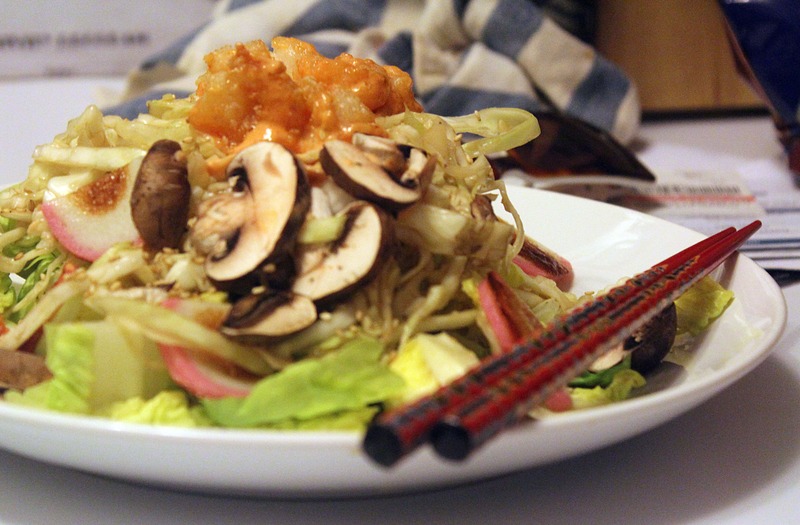 Often when I don’t feel like cooking, I’ll make a big Asian Salad with all the veggies in my life and call it dinner. 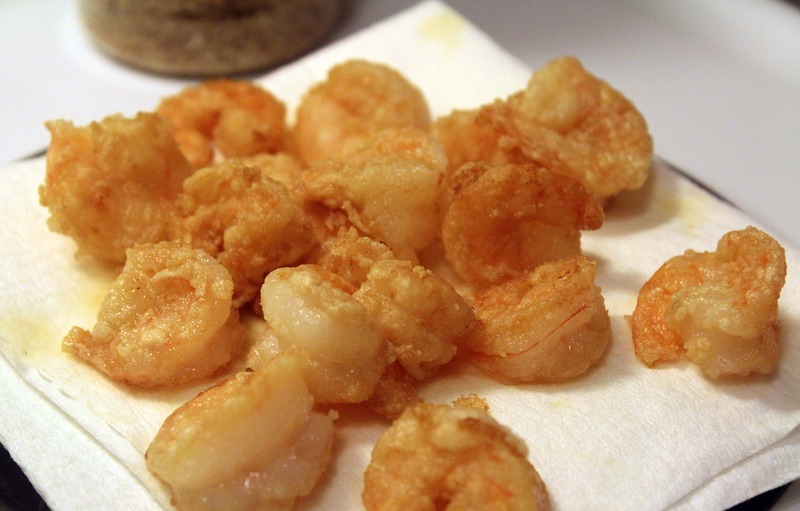 If I’m feeling really fancy I’ll fake-fry some shrimp and put some bang-bang sauce over the whole thing. That is super duper delicious. So, the dressing can be found here. Make a double batch of it and eat it all week! 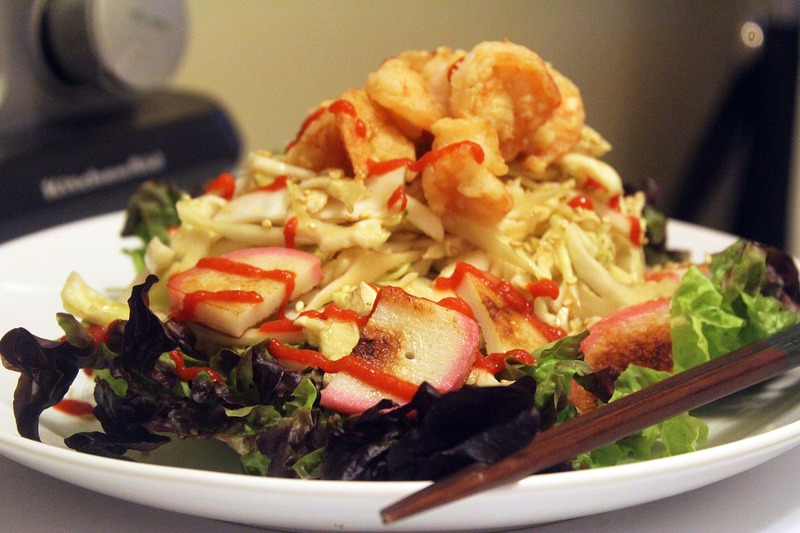 While I’m working on the shrimp, I like to pour the dressing in a bowl with some thinly sliced cabbage to marinate. For the salads, I make a naked bed of lettuce with any veggies I want. For the bang bang sauce….I’m so embarrassed to tell you…. It’s just mayo and Sriracha sauce. Seriously. I like to use 1/2 teaspoon chili sauce to 1 tablespoon mayo (obviously make 2 tablespoons or so per person) and then taste it to see how spicy it is. Add as much sriracha as you can handle! So good. Sometimes people get fancy and put a splash of rice vinegar, sesame oil, sugar, or whatever else they want to into their spicy mayo – that’s all Bang Bang sauce is, bee tee dubs, but I think the two ingredients by themselves are just perfect. Use mayo. Just this once. Not anything fake that tastes like plastic. Trust me. 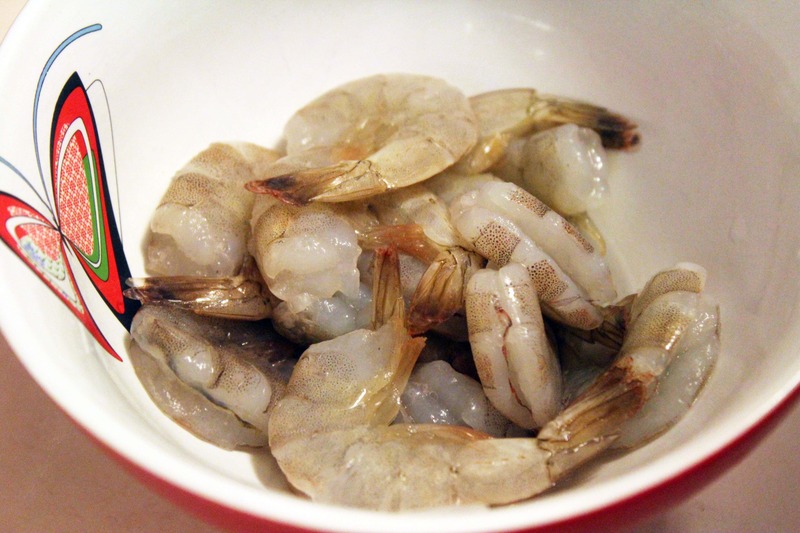 For the shrimp, be sure it’s thawed and peeled. Drain it on some paper towels. 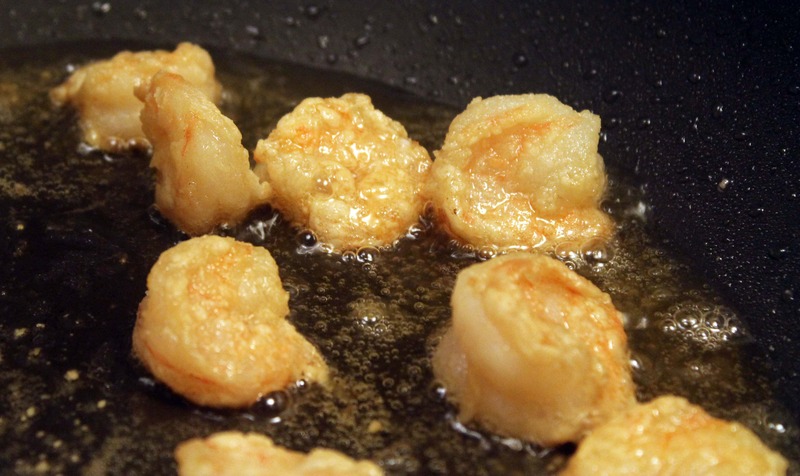 While that’s happening, heat a thin layer of oil (your choice, I like vegetable for this application) in a large pan – you want the shrimp to have plenty of room to be peaceful and private while they’re frying. Then, in a feat of culinary genius, dump some flower all over the shrimp, and stir it around. Easy, huh? 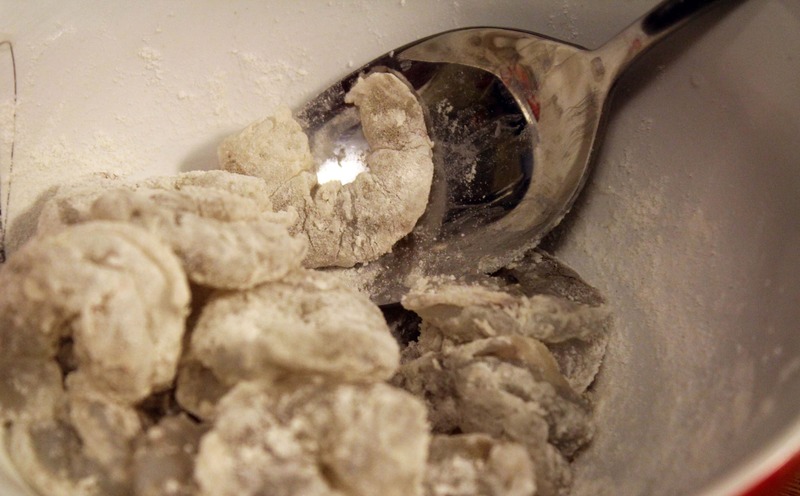 When the oil is very hot (10 minutes at medium or medium high heat should do the trick), dump all the shrimp in the pan – toss out any extra flour. Let the shrimp sizzle! If they don’t sizzle, turn up the heat and do a better job next time. No worries. 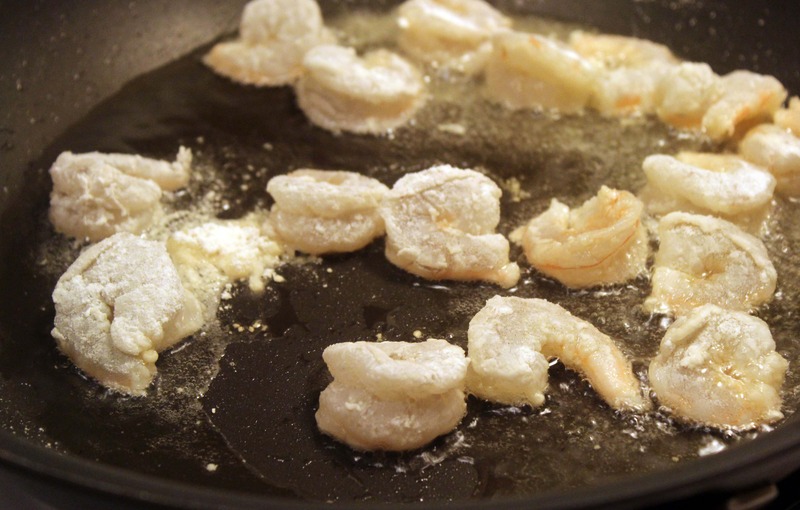 Once the shrimp start to turn pink on the first side and the flour gets crispy – this only takes 2 minutes or so, flip them and let them fry on the other side! When the shrimp are opaque all the way through, they’re done. Let them hang out again on some paper towels to drain. Notice that we didn’t salt the shrimp. That’s fine! There is so much salt in the shrimp sauce and soy-based dressing that you don’t need it. I promise. 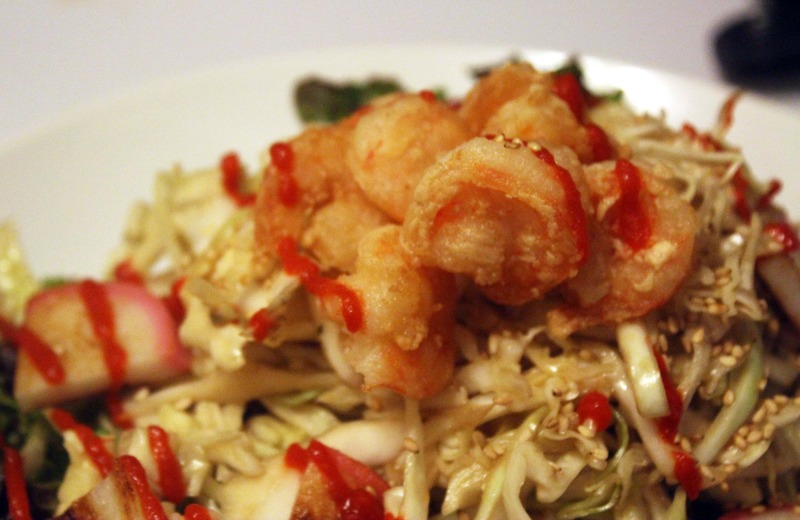 While the shrimp are draining, top each of your salads with some cabbage and dressing. YUM. Oh, I had this fish cake, too! 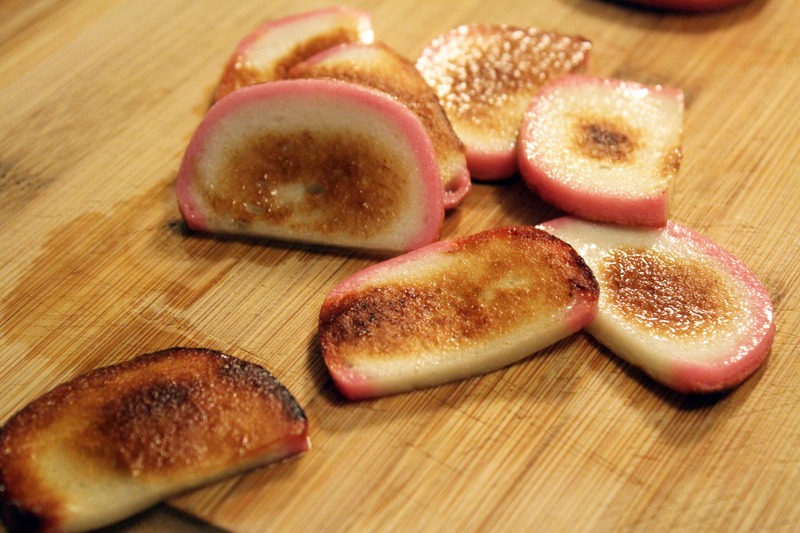 I sliced it and crisped it up in the shrimp pan. You don’t have to do that if you don’t want to. 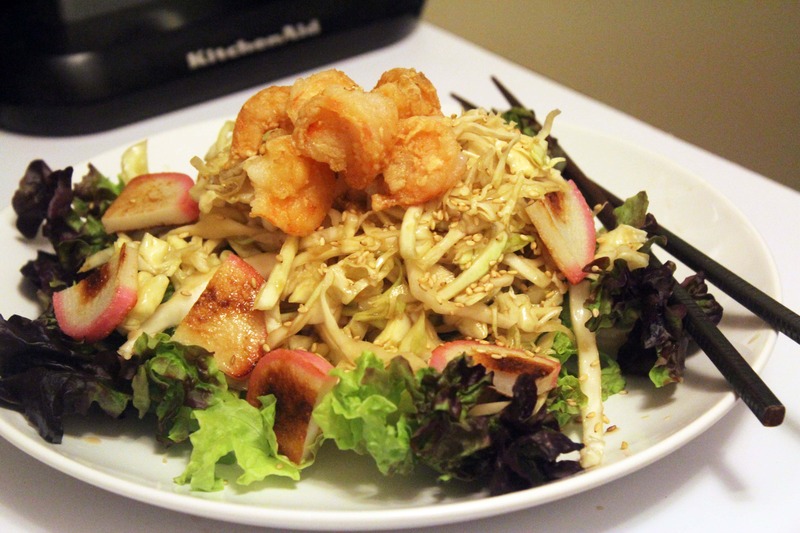 Top the salad with shrimp. Now, I drizzle the bang bang sauce all over the salad. You could also toss the shrimp with the sauce and serve it that way, but Jay doesn’t like mayo going into his body. It’s a former fat kid thing. He DOES love spicy food, though. So, his salad looks like this! Not a bad way to enjoy fried shrimp, if I do say so myself! Mine, however, looks like this.